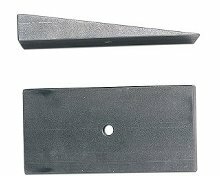 Steel Degree shim, available in 4* (RE1467), 6* (RE1468), or 8* (RE1469). We make these shims from solid steel for maximum durability. Designed to handle the rigors of trail use, these shims actually become part of the spring pack. Many other shims on the market float between the spring pack and the spring perch reducing the engagement of the center pin. Our design will not come loose or fall out. Can be used front or rear to set pinion angles. 2.5" wide springs only. If using with Rubicon Express springs, the center pin hole in the shims may need to be drilled out to fit the larger RE center pins.